PRODUCT: EPDM/TPO Contact Adhesive, LionGUARD LG-BA-LV. Low-VOC Neoprene Rubber / Resin based adhesive. Use with EPDM and TPO Roofing Membranes. Made in USA. 5-Gallon Pail. Price/Pail. Flammable item. UPS Ground or truck Shipment ONLY. Low VOC -- Cannot ship to SCAQMD areas and other Low VOC restricted areas. DESCRIPTION: LionGUARD Low-VOC Neoprene Contact Adhesive LG-BA-LV is a Rubber / Resin based adhesive that allows quick bonding of TPO or EPDM membranes to wood, metal, masonry and other approved roofing substrates. It is a rubber and resin adhesive formulated specifically for use in TPO and EPDM projects as printed on the container label. It may also be used as a general contact bond adhesive for other application. FIRST MIX WELL WITH A POWER MIXER. Apply a thin coat by roller to BOTH intended bonding surfaces and let adhesive “dry” until it is tacky to the touch. Mate both surfaces and apply mild pressure to fuse sealant (roll with weighted roller). COVERAGE RATES: For smooth surfaces, about 60 square feet (56 sq m) per gallon of finished surfaces (120 sqft / gallon on each surface to be mated). Porous and irregular surfaces and substrates may require more bonding adhesive than the typical coverage rate. 1. Read the complete Material Safety Data Sheet for all safety information prior to use. 2. 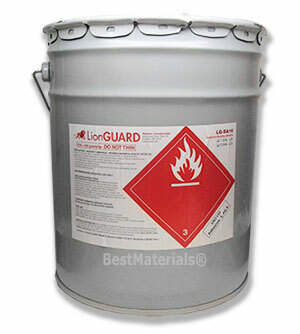 LionGUARD Low-VOC Neoprene Contact Adhesive LG-BA-LV is EXTREMELY FLAMMABLE - It contains solvents that are dangerous fire and explosion hazards when exposed to heat, flame or sparks. Store and use away from all sources of heat, flame or sparks. Do not smoke while applying. Do not use in a confined or unventilated area. Vapors are heavier than air and may travel along ground to a distant ignition source and flash back. A red caution label is required when shipping. 3. Do not thin Contact Adhesive. Thinning will affect performance. Excessively thick or gelled material should be discarded. PRACTICE YOUR TECHNIQUE BEFORE USE ! 35 Lb stand-up 16 inch wide steel membrane roller. Used for rolling adhered epdm / adhered roofing membranes, vinyl / linoleum floors etc. 3 Floating polished-steel rollers. Heavy-duty contractor grade construction. Price/Each. Paint Roller Cover, 9-inch, 1/2 inch nap, 1-1/2 ID, Solvent Resistant Polyester Nap and Core. For use with all types of coatings including solvent based coatings, epoxies and urethanes. Price/Each.